This miraculous neck cream is designed to penetrate and revitalize the deep wrinkles and sagging skin of the neck and chin area. With powerhouse ingredients, including stem cells*, the Neck Restoration Cream aims to provide an instant firming and lifting effect, while also providing the long-term benefit of tightening the loose, saggy neck skin and getting rid of “turkey neck”. 1. Improving the look of very loose skin on the neck. As we age and levels of collagen and elastin lower in our skin, several areas of our skin are prone to getting very saggy. The most infamous area is the neck. The Dermagist Neck Restoration cream has specialized ingredients which target exactly that… very loose skin. By providing the perfect type of moisture to the skin, and utilizing ingredients specifically engineered for the type of looseness of the neck skin, this neck cream has gotten fantastic reviews. The constant turning and rotation of our heads, and the resulting creases which form on our neck skin, renders the skin of the neck prone to having very deeply entrenched wrinkles. Compared to other areas of the face or body, the wrinkles which can form on our neck area tend to be much deeper and thus, much more stubborn to improve. The Dermagist Neck Restoration Cream includes a very special formulation of ingredients which were specifically designed to go after these extra stubborn, deeply entrenched wrinkles. Users of the product are often so impressed by the benefit to their deep neck wrinkles, that they actually use this cream on other areas of the face and body too. The improvement of the loose skin of the neck area is certainly no overnight undertaking. The ingredients in the Neck Restoration Cream DO aim to improve the overall firmness and elasticity of the skin over the long haul. But for those seeking INSTANT gratification, a natural tightening ingredient which provides an instant effect has been included. This instant effect ingredient ALSO has long term moisturizing properties, and is extremely comfortable for users. This makes it the perfect ingredient in the Neck Restoration Cream. Nobody wants to use a skin improvement cream that offers some brief improvement, only to quickly return to the previous state. The Dermagist Neck Restoration cream was designed with that thought in mind. While the product certainly aims to provide rapid results and improvement, every ingredient was hand selected for ALSO having long term benefit to their use. So, with continued use of the product, users can enjoy the concept of getting the results they want in the short term, and continuing to see them in the long term. 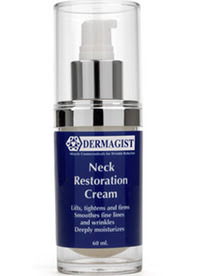 Product : Dermagist Neck Restoration Cream. All Items are new set, and original imported from USA. RM259 / USD81 per bottle.